MinerBumping.com: Meet Me in Lowsec, or: What Ever Happened to 1v1 Duels? Meet Me in Lowsec, or: What Ever Happened to 1v1 Duels? In the days of old, when EVE pilots were bold, there was such a thing as "solo PvP". There's still solo PvP today, but it usually involves a scout alt, a booster alt, a falcon alt, etc. In the very beginning, there were even one-on-one duels. There are still 1v1 duels today, but they involve one pilot dueling another pilot and being ambushed by his 20 closest friends. I still hold to the honour of the 1v1 duel, but it must be done according to the Code. An opponent must first prove his worth by passing any one of the three great trials: The Test of Wisdom, the Test of Valour, or the Test of Fortitude. For some reason, people I bump often demand that I duel them according to their own terms, rather than the Code. To which I respond, "Who died and made you the Supreme Protector?" You will remember Eno Bray, a Code violator from Kino who recently earned the dubious distinction of being featured in a "Tears of the Day" post. 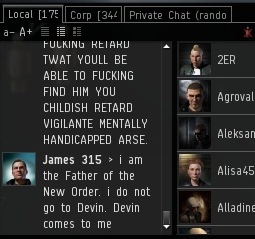 He demanded I meet him in Deven, a lowsec system. I asked him a leading question because "meet me in lowsec" is a Miner Bingo line. But there was a twist. 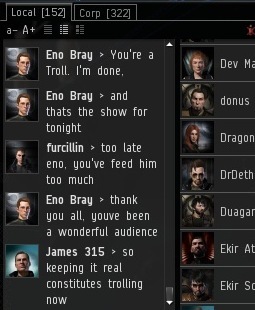 Eno Bray didn't want me to duel him, he wanted me to duel his PvP alt in another system. I had not yet encountered this variation, so I was a bit confused at first. I gave him an appropriate response. 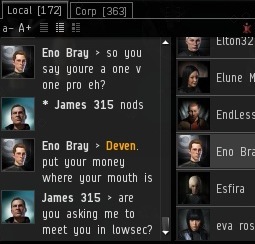 Eno continued to attempt to negotiate a 1v1 duel on behalf of his alt, but I tried to steer the conversation back toward a more reasonable course, one guided by the Code. James 315 > Eno Bray are you brave enough to do battle with me? Eno Bray > Go to Deven. 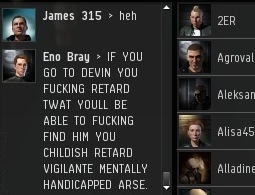 I tried to explain that in EVE, every player must defend himself. He cannot make threats with one character and cash the checks on an alt. Eno continued to rage, refusing to read the relevant section of the Code. James 315 > in what possible way am i like either of those two? Eno Bray > Discrimination towards miners? Sadly, the conversation was derailed, ruining all hopes that we could organize a proper 1v1 that day. Finally, Eno concluded that I was a mere troll, not a true warrior. I don't know where he got that idea, but he terminated the conversation. Eno vowed never again to respond to my "troll" antics. A bold, but misguided notion. Would it last? I'm curious, the Invincible Stabber would certainly come to some use in a 1v1, apart from the fact that the Invincible Stabber does not possess combat abilities. Is there an Official State Combat Ship for the Supreme Protector? I don't fit guns on my ship, but lots of heroes like MacGyver and the Batman don't use guns either. I defeat my opponents using my wits. Beautiful. Simply beautiful. The amount of rage is astonishing. Yes, he raged, and James still played carebear. Truely sad indeed, James. You're no better than the miners you despise. Bumping is PvP. PvP is the opposite of carebearing. Therefore, you are wrong! No, bumping is griefing someone in a ship that can't possibly counter the bump. Even if another bumper came along, it may be PvP but it is definitely carebear PvP as there is no danger to losing anything at all. So I'm not wrong in the slightest, you're just a big ol' carebear James, deal with it. Just like the other miners you claim to be so much better than, you're just carebearing along in highsec. You will never fight to back up any claims you have made about being the best 1v1 around. Until that day comes that you put away your stupid rules to 1v1 and just go do it, you're a carebear. And don't tell me "if I drop rules then I wouldn't be following the code" because you don't follow the code anyway, code isn't against miners that are sitting at their keyboards, yet you bump them anyway. No danger? Ask my enemies who lost ships while trying to suicide gank my Invincible Stabber. Yes, I retain my title when it comes to winning 1v1's. When you're king of the mountain like I am, you set the rules for duels, and the Code is quite clear about them. P.S. I only bump miners who violate the Code; the AFK provision is but one rule they must follow. No danger to you. You have concord on your side, I can't believe you really need this explained to you... For some one who has been around since '06 you think you would understand the game better. "Eno Bray > SOAP BOX?! @ SOAPBOX? !#(&@TY( &("
I thought for sure he was having a literal aneurism, there, and just died on his keyboard. Keep it up, James! All hail the Supreme Protector! How Do I Fit My Stabber? What's the Deal with My Bounty? Miners Turning Against Each Other? Why Do Miners Violate the Code? AFK Ratting Bad, AFK Mining Good? What Exactly Is AFK Mining?